A Grade II-listed former bank in a popular Lincolnshire town is for sale in SDL Auctions Graham Penny’s auction at Nottingham Racecourse on Thursday 6 December. The former HSBC bank branch at 7 High Street in Boston is a traditional banking hall with offices, interview rooms, cashiers, safe room, breakout area, internal staircase and basement entrance, and a second staircase with an external fire escape gives access to the upper floors. The property, which has a *guide price of £200,000+, is located on the main pedestrian route into the Market Place at the foot of the Town Bridge, with nearby stores including Boots, three building society branches, Coral bookmakers and KFC. Nick Trow, commercial valuer at SDL Auctions Graham Penny, said: “This unique building is prominently situated in an established retail parade in the bustling market town of Boston and could be suitable for a variety of commercial uses, subject to planning permission. 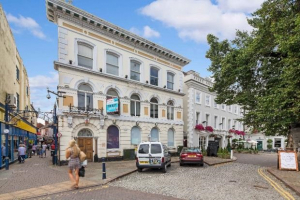 “As the property is Grade II-listed, it is therefore exempt from council tax while it is vacant which is a major benefit for any investor potentially planning a period of redevelopment. Another commercial property opportunity in the auction is a three-storey, mixed-use lot at 8 Market Place in Long Eaton, which has a guide price of £150,000+. This contains a retail unit on the ground floor with full planning permission to convert the upper two floors into four apartments, which could potentially generate a gross annual income of around £39,000 when fully let. The full catalogue for the SDL Auctions Graham Penny Nottingham auction at Nottingham Racecourse on Thursday 6 December features 33 lots and can be viewed here.